Joel joined the GLFCAM family in time for the second full year of programming. A Bay Area native, Boonville has quickly become another home for him. As the Administrative Director, Joel often gets to be the first point of contact for the Academy. He helps manage email correspondences, keeps the website up to date, reminds folks of deadlines, assists Jeremy in capturing media during residencies, and serves as the resident vegan. Outside of the Academy, Joel works as a software engineer in San Mateo. Passionate about tech inclusion, he seeks to create more pathways for people of color to pursue careers in tech. He graduated with a BA in Music Theory from Whitman College where he studied voice and championed opportunities to study and perform music outside of the Western canon. He currently performs as a member of the San Francisco Gay Men’s Chorus. Erika is a composer, pianist/flutist, and educator based in the SF Bay Area, happy to join the GLFCAM family in its third year where she assists Joel in the office and onsite during the residencies. She has composed works for big band, small jazz ensembles, chamber groups, dance and theater. As a performer, she is a member of the Montclair Women’s Big Band, Ends Meat’ Catastrophe Jazz Ensemble, electro-jazz duo Rice Kings, and The Sl(e)ight Ensemble. As an artist, she is interested in exploring ritual, diasporic identities, and community through performance. She received her BM in Jazz Piano Performance from Oberlin Conservatory and her MA in Music Composition from Mills College. As Coordinator of Community Liaison, Lama draws on her love of the Anderson Valley to bridge music, community organizing, and food justice. In Boonville, she works with the Anderson Valley Foodshed, a non-profit that promotes vibrant and healthy local food systems, while homeschooling a half wild kid (aka Forest Creature) with her husband Matthew, a horticulture/garden specialist and small-scale organic farmer. 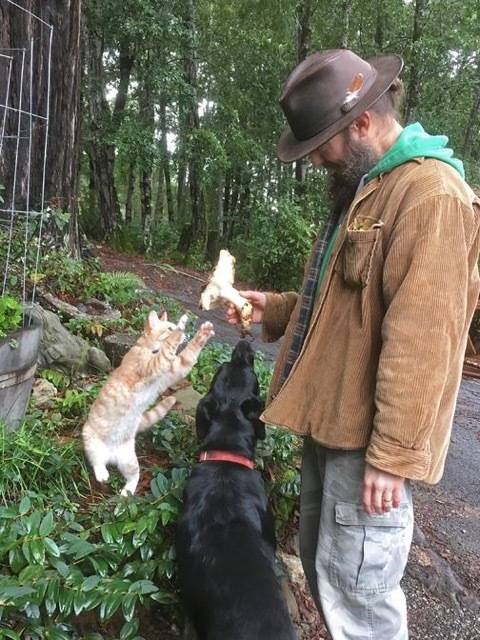 Together, this family of three supports itself through the cultivation and sale of organic mushrooms according to the principles of permaculture and community connection. Lama, born in the United States and of Palestinian descent, holds both a Bachelor of Fine Arts in photography as well as a Bachelor of Arts in philosophy and religion. A trained biologist with a particular specialty in mycology, the study of fungi, Lama is an avid cook and loves creativity of all kinds. She is especially fond of the musical compositions of her daughter, a first-year piano student who regularly serenades frogs and lizards, and looks forward to when Forest Creature someday matriculates into her godmother Gabriela’s Academy. A Napa native with forbearers who sought their fortunes in the California Gold Rush, Jeremy is connected to the Anderson Valley through his grandfather, a Boonville native, who owned a music store in coastal Fort Bragg and spoke Boontling. While music was a constant in his family — Jeremy’s father was a 70s rock-n-roller and his brother is an accomplished electric bass player — Jeremy was compelled towards nature as part of what would become the back-to-the-land movement. His interests took him to the mountains, rivers, and forests where for decades, he honed his skills as an outdoorsman and gardener. His work rehabilitating pit bulls and rescuing exotic animals as well as managing a fishing lodge in the Trinity Alps further round out this adventurer upon whom wilderness philosopher John Muir would have smiled. Nowadays, Jeremy’s time is taken up with building his dream farms along principles of permaculture, Timberstone Mountain Farm and the Timberstone Guest Cottage (Lyon House), both of which he co-owns with his composer lady Gabriela. As videographer and co-host for the Academy, he delights composers and performers with gifts from his treasure hunts of local semi-precious stones, showing off reptiles and chickens he hand-raises, and serving as a general nature guide to Boonville and the surrounding areas of Mendocino County. My first interactions with Gabriela and Jeremy were centered around meals. It was apparent that we felt a kinship based on the shared values of producing our own food and preparing it in creative ways. My first visit to the GLFCAM was notable for the bounty of ingredients that were from farms and nature. I've cooked in Michelin starred restaurants but find my application of skill in the kitchen is more rewarding when it nurtures those that aren't purchasing it. Fostering the creativity at the academy is the sort of thing I aim for in my culinary endeavors. That moment of quiet as forks are lifted to mouths and savoring begins is the loudest praise I desire. Originally from Pittsburgh, PA, Dan now lives in Boonville, CA where he is a composer, performer, audio engineer, and poet. Dan is happy to be a part of the GLFCAM family where he uses his keen ears to record all public events.